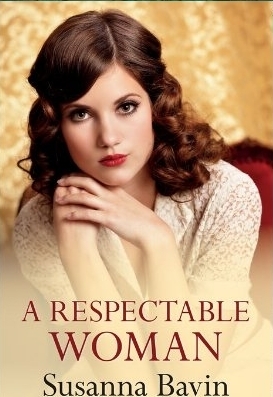 The audio version of A Respectable Woman is read by Julia Franklin, who read The Deserter's Daughter. Here is a short clip of the beginning of the story. You may also enjoy this short clip in which Julia explains why she loves reading audiobooks. This is the cover of the large print edition, published by Magna. To find out more about the plot and characters, click here to read two more blurbs I wrote for the book. See which of the three blurbs you like the best. To find out how Nell, the heroine, came by her name, click here. 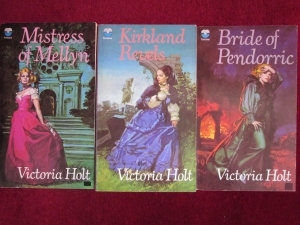 Why the picture of books by Victoria Holt? Click the link and find out! "Escaping one’s past is at the heart of this endearing historical romance...Bavin’s character-driven narrative, peppered with colloquial dialogue, rings with authenticity... The sweet attraction between [Jim] and Nell give the story heart, while Bavin’s finely sculpted cast of secondary characters, most of whom are struggling with postwar poverty, give the story true substance. The focus on historical and emotional authenticity will leave readers heartily satisfied." "...complete with a jaw-dropping twist near the end, this is a well-crafted novel with a strong, compassionate lead character and a splendid sense of time and place." "As the pages turned I was outraged at the treatment of women in the 1920s and desperate to know how Nell would resolve her problems... Susanna Bavin’s first book The Deserter's Daughter kept me awake until the small hours as I was so keen to find out what happened and A Respectable Woman was no different. If you love a saga this is a book for you. If you don’t classify yourself as a saga lover (and I don’t), the themes and the twists of the story will have you hooked." 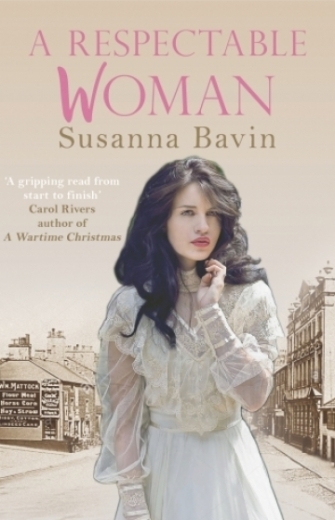 "With her second book Susanna Bavin has cemented her place as one of the country’s leading family saga writers. 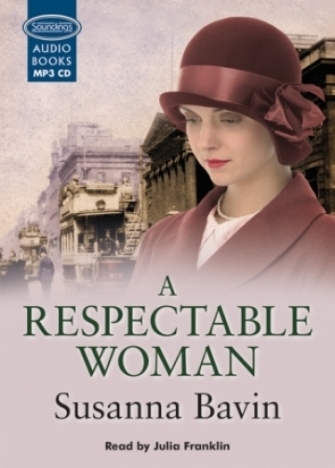 Following the success of her debut, The Deserter's Daughter, it must have been quite a feat to come up with a story equally as good but, in my opinion, she’s produced something even better.... From the first page, Susanna pulls you into the backstreets of 1920s Manchester so that when you’re done you’ll be wanting to scrub your front doorstep and send your children out to play in the street with their mates (although no noisy games on a Sunday). ...Then there’s the villain. Susanna seems to have a particular skill for conjuring up nasty pieces of work and Edmund is up there with the best of them. Thinking about him still makes my blood run cold..."
This is an old photograph of Edge Lane. 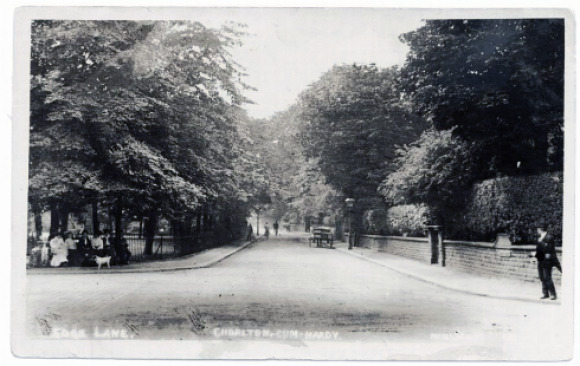 On the left hand side, you can see the trees that edge the grounds in which stands St Clement's Church. On the other side of the road on the right, and further down (it would take you five minutes to walk that far), is where Mrs Randall and Mrs Marsden live in the story; and where Nell helps look after the girl when she is knocked down. There were lots of trees along Edge Lane. Here is the start of the accident scene in Chapter 16. "The foliage overhanging the garden walls on Edge Lane was young and fresh. Jim pushed his barrow, enjoying the variety of greens shifting in the breeze, the deep green of the horse chestnut complete with its candles of white flowers, the glossy green of the laburnum with its fluid tassels of golden blooms, and the bright green of the good old beech. That exhausted his knowledge of trees. He ought to learn more, just as he had learnt the names of the wildflowers on the meadows. Living this simpler life had given him the time to discover an interest in nature." 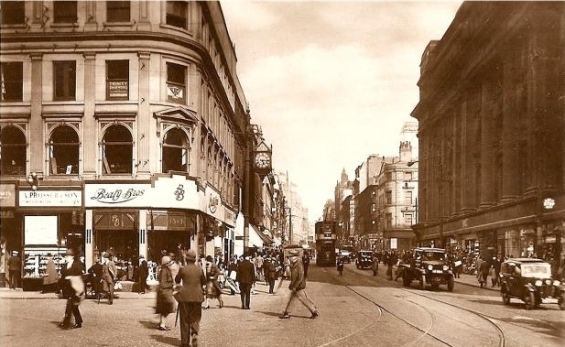 This picture shows Market Street, where Nell finds work at Ingleby's. Beside a caged lift stood a uniformed lad, but today of all days was a time for sticking with what she knew, so she went up the stairs into an Aladdin’s cave of ribbons, braids, beads and buttons. It would be a joy to linger and explore, but she saw a sign for the Sewing Machine Department and wove her way towards it, her heart speeding up."